Tag Archive | "docking station"
My full review of the HP Pro Tablet 608 G1 is now available on Notebookcheck. It scored 78% which is good, but, not that good. The docking station and USB-C port, screen and build quality are excellent but there’s one thing that’s not quite right. Dell Wireless Dock offers seamless WiGig connectivity, at a price. We first started reporting on WiGiG back in 2012 with a prediction that WiGiG ‘docking’ would be available in 2013. It was! 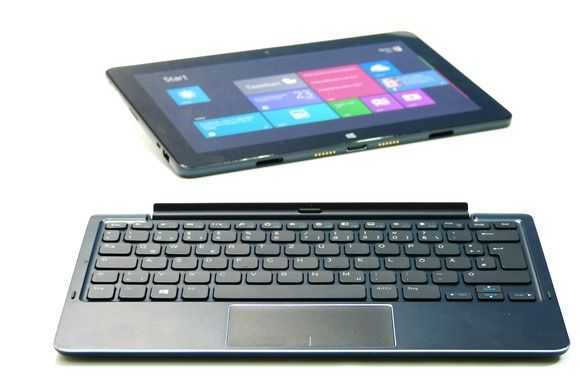 Dell launched the Latitude 6430U in 2012 and a WiGig dock was available in 2013. It was a pre-spec WiGig however and when WiGig moved into the USB Alliance there was a long period where nothing happened. The next WiGig dock to hit the market was the HP unit that I checked out at CeBIT 2015. Today it’s Dell’s turn again and it looks like the wheels are rolling. The Dell Universal Dock will be available starting April 30th for €329.64. It was last September when my Ultrabook screen went blank and never came back. I was gutted; Not only because it was my favourite PC but because I was half-way through reporting on the IFA trade-show and I had a flight to the IDF conference 2 days later. Thanks to Intel Germany I flew out with a Surface Pro 3 and the more I use this incredibly well-designed tablet PC, the more I like it. It’s not my main PC though and I thought I would take the time to explain where the Surface Pro 3 fits into the life of someone who is literally surrounded by touch-screen tablets, laptops and mini PCs. The Surface Pro 3 has taken on the important role of being my hot-desking PC. The Surface Pro 3 is a powerful lightweight Windows tablet PC with touch and digitizer but I find myself loving the Surface Pro 3 simply because it’s a lightweight mobile PC that I can dock at home and in my co-working office [A big shout out to my Coworking Bonn buddies] and one that I can use for meetings, in the coffee shop and in the bus home if I need to. Apart from the lack of 3G/4G the Surface Pro 3 is one of the most ultra-mobile, work-anywhere PCs I’ve ever used. Let me start by reviewing the Type Cover keyboard. This bouncy slice of mechanics feels strange, unlike any keyboard I’ve ever used and yet it’s productive. It has a backlight too! It snaps willingly to the tablet and is the perfect demonstration of how a tablet can turn into a laptop. Almost. The biggest issue with this setup is the area required to hold it stable. 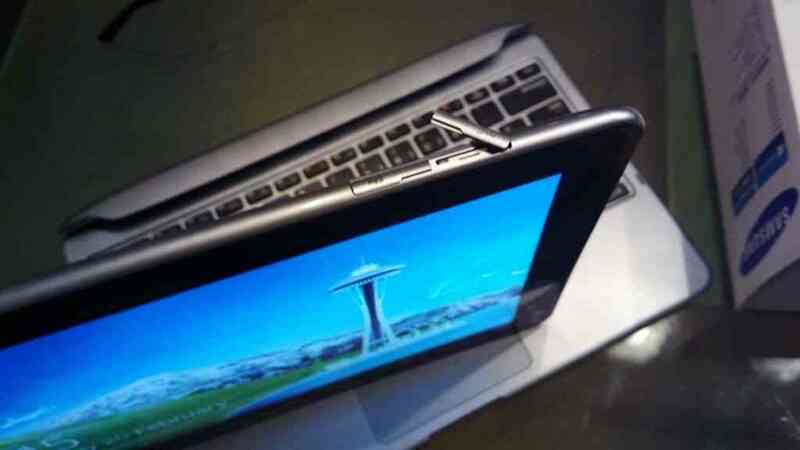 A laptop requires the area under keyboard; The Surface Pro requires an extra 200 mm behind it for the stand. It’s this huge area that will cut your productivity over a standard laptop if you rely on ‘lap-toping.’ I tried it for a few keynotes and press events and wasn’t happy with stability. Despite that the stand is worth having and after 4 months using the stand I don’t have any sign that the mechanics are wearing out. The Surface Pro 3 is an expensive hot-desker. $780 buys you a Core i3, 64GB, digitizer-capable tablet but if you don’t need the pen-layer you might not be getting best value for your money. Prices for Ultrabooks have come down recently and a when I look at devices like the Dell XPS 13 (2015 version with Broadwell) I see more battery life, a bigger screen, a better keyboard and more processing power for the same money and just 10% more weight. The Core-M mobile PCs are looking good too. The Lenovo Yoga 3 11 and ASUS Transformer Book T300 Chi are around the same weight and the Acer Aspire Switch 12 is entering the market at just $699. There’s no digitizer on the Acer Aspire Switch 12 and it’s not as powerful as the Surface Pro 3 but it’s much cheaper and arguably more suited to being docked as you can use the Bluetooth keyboard and pointer. Many of these Core M options are fanless too and that makes a difference in a quiet office. The Surface Pro 3 isn’t loud in normal use but I occasionally hear the sound of a working background process or a heavyweight web page. When I’m rendering my 1080p videos the fan gets almost embarrassingly loud in my co-working office but one can’t moan when it crunches through transcoding with such speed. 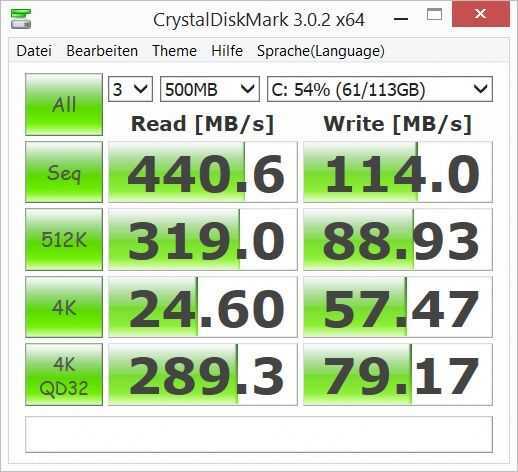 Quick Sync has come a long way since I first tested it with a 1st-generation Ultrabook in 2011. Handbrake (with Quick Sync support) can now crunch a 1080p 50 FPS 30Mbps file down to 720p at over 200 frames per second! At this point I should note that I don’t have a digitizer pen but as I have other devices with a digitizer I know that I rarely use such a feature. The only time I really wanted a pen was when I was using the Surface Pro 3 as a whiteboard over Miracast to an Actiontec receiver on a projector. It would have been nice to use One Note as a whiteboard but as it turned out, my finger wasn’t bad either. While I’m normally mains-power connected I have had reason to worry about battery life. The Intel Developer Forum proved to me that you won’t get through a day without a charger and that, unfortunately, adds weight to the overall package. This is significant as the Ultrabook I was using previously could get through a day meaning that the 1.4KG was all I needed. 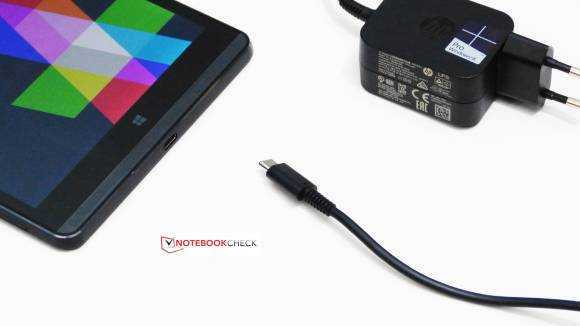 200 grams of power supply brings the total tablet/type-cover/power weight to 1.3KG. Looking at the ‘powercfg’ battery report I see that the battery hasn’t worn in the last 4 months at all which indicates that Microsoft have used a good quality battery. The port choice on the Surface Pro 3 needs consideration. A Mini-DisplayPort is provided for video output and although DP is generally the most flexible it’s not that common to find it on mainstream monitors or projectors. I’m using a DisplayLink video connection (over USB 3.0 via the docking station) which solves that problem but it reduces the quality of graphics and video playback and requires some work from the CPU. That’s not an issue for office-usage but it needs to be mentioned. The docking station also solves the issue of available USB ports. One port isn’t enough for hot-desking if you don’t have a USB hub or USB docking station. Finally there’s the issue of using a MicroSD card slot if your camera uses SD cards. Again, a USB adaptor is required. Speakers OK for background music. Looking forward to Windows 10. Display colors and brightness is excellent. Connected Standby works but isn’t as efficient as it should be. Bitlocker encryption (full disk encryption) enabled. Useful USB charging port on the power adaptor. Satisfactory 1080p editing (for short, simple YouTube projects) and rendering speed using Cyberlink Power Director 12 and Intel Quick-Sync rendering hardware. I could use the Surface Pro as my only PC and it makes a fantastic hot-desking solution if you’re prepared to set up a USB 3.0 dock or DisplayPort screen and USB hub but there are two major considerations. 1) The Surface Pro 3 isn’t the best hot-desking solution at the price. Many Ultrabooks would be better as they would offer a better keyboard experience, more ports and larger battery life for a similar weight. The new Dell XPS 13 2015 is the one to watch. 2) The surface Pro 3 isn’t the best casual tablet. It’s too heavy and large. Where the Surface Pro 3 shines is in flexibility and quality. The Surface Pro 3’s digitizer enables annotations, hover-actions, projected white-board and a digital canvas and there are times when I really wish I had the stylus. [I don’t have it because the SP3 was given to me by Intel without the stylus.] The Surface Pro 3 can handle 1080p video editing. The Surface Pro 3 is a quiet desktop. The Surface Pro 3 can be used in more places than the average laptop. Finally, the Surface Pro 3’s quality is always a pleasure to have to the point where I’m proud to be using it in my co-working space and whenever i’m on the road. 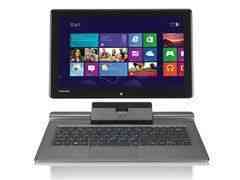 It will be my working ‘laptop’ when i’m at MWC and CeBIT in March. Alternatively, without the docking station and monitor I would use a mini USB 2.0 hub, USB Gigabit Ethernet adaptor and a cheap laptop stand. I’ve written about future Surface Pro platforms before where I highlighted a number of routes to the next Surface Pro products. A smaller, lighter, fanless Surface Pro is possible with Intel Core M or there’s the possibility to improve the SP3 all-round by using a fanless Skylake platform later in 2015. Having a fanless option with wireless charging and WiGi would showcase Skylake well and I think this is the most likely scenario for Surface Pro 4. The Skylake option is something that could be demonstrated in Q3 for Q4 availability. Here’s a rundown of the options. 10-inch Core M – Potential to be the most powerful 10-inch tablet in the market. Laptop-replacement CPU performance. Fanless. Could be expensive for the 10-inch category. Untested market. Not as powerful as Surface Pro 2 or Pro 3 but close. Would be a great Windows 9 showcase. 11.6-inch Broadwell-U – Performance boost and battery life improvements over Haswell-U but not a huge change. Smaller screen might not fit customer expectations. 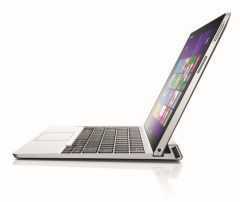 12.5-inch Core M – Performance boost and battery life improvements over Haswell-U but not a huge change. Lighter build. Cheaper cost might not be enough for a flagship model. 13.3-inch Core M – A bigger Surface Pro but with no CPU performance improvement over Surface Pro 3. Fanless. 13.3-inch Broadwell – Too heavy for a tablet with a 15W TDP Browdwell although ‘TDP-Down’ configurations could be used to reduce this. 12.5-inch Skylake – A significant performance improvement over current Surface Pro 3. Could offer a fanless version. Not enough is know about the platform at this stage but ‘wire free’ is likely to be one of the showcase features. 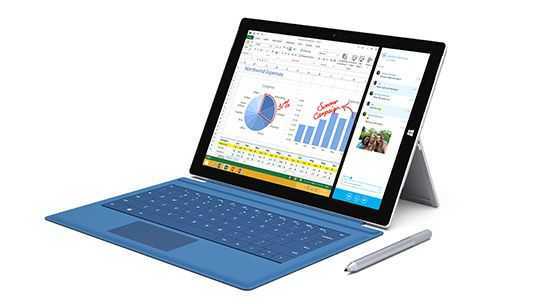 Microsoft Surface Pro 3 information including videos, articles, gallery and specifications available here. How do you solve the problem of Google not allowing Dual-OS on a laptop? 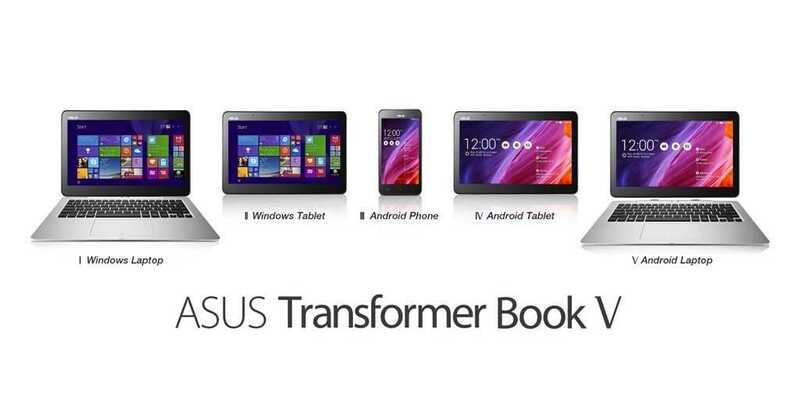 You do what Asus has just done with the Asus Transformer Book V (five) 5-in-1 laptop/smartphone which was demonstrated at the Asus press conference in Taiwan today. Looking a bit like the Asus Padfone products which allow you to dock a phone into a screen and keyboard module the Transformer Book V5 does a similar thing but allows you to dock an Android phone into the back of a WIndows Notebook thus allowing the user to either view the phone as a small window or to go full-screen for a full Android laptop experience. The feature only works between the two specially developed devices and it looks like there’s not much in terms of sharing. For example it’s not clear if you can use the LTE on the phone from the Windows OS. Does the laptop charge the phone? Can you drag and drop files between the two devices or even share storage? The laptop comprises a ‘HD IPS’ 12.5-inch touchscreen and runs Windows on an unspecified ‘next generation’ Core processor. There’s a very simple set of ports available. The phone has a 5-inch screen and runs Android 4.4 on an Intel Atom quad-core CPU, has ‘up to’ 128GB of storage (possibly with MicroSD?) and a 2500mah battery. Watch out for a bit of smoke and a few mirrors here because while the demo looks great the integration between the two devices might not be as deep as you think. This simple integration could be exactly what some people are looking for, at the right price. Engadget have some more info on the specs and they look relatively high-end. Transformer Book V is the world’s first five-mode, three-in-one converged laptop that features a Windows and Android laptop and tablet as well as an Android smartphone, making it an incredibly flexible device able to excel in any usage scenario. Its revolutionary and elegant design comprises a laptop with a detachable 12.5-inch screen that becomes a separate tablet and a 5-inch smartphone that docks into the tablet. As a laptop, Transformer Book V includes a full QWERTY keyboard and touchpad, and runs both Windows 8.1 and Android 4.4 KitKat. A dedicated hardware button provides instant and seamless switching between the two operating systems. The laptop features a next-generation Intel® Core™ processor providing high performance for an efficient and productive user experience. The 12.5-inch HD IPS display has sharp graphics and rich, vibrant color, and touch support adds additional convenience and functionality when using Windows 8.1. 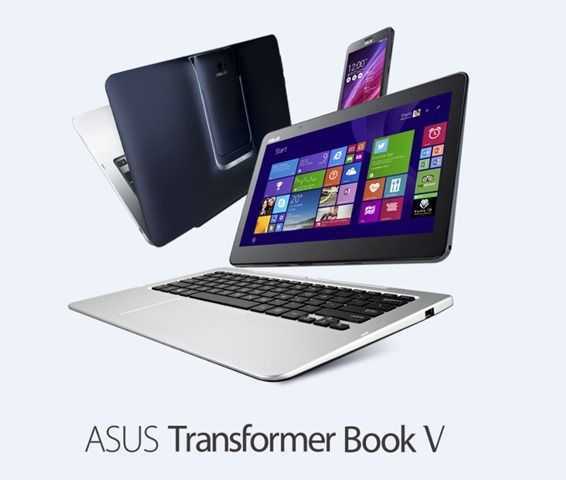 Transformer Book V comes with ample storage of up to 1TB for apps, documents, media and more. As a tablet, Transformer Book V also works as a standalone Windows 8.1 tablet and an Android 4.4 KitKat tablet when the phone is docked. Switching between the two systems only takes a tap on the screen. Access to the Google Play Store and Windows Store provides a massive amount of apps and games to choose from, making Transformer Book V a highly-mobile entertainment and productivity powerhouse. Its built-in storage of up to 128GB offers plenty of room to store those apps along with movies, photos, music and more. As a phone, Transformer Book V runs Android 4.4 KitKat, and is the world’s first 5-inch LTE smartphone powered by an Intel® AtomTM quad-core processor, giving it unparalleled performance when running apps, playing games or browsing the internet. Its Long-Term Evolution (LTE) support delivers a superior internet experience with network speeds that are up to four times faster than 3G. Transformer Book V comes with a 2500mah battery that provides up to 10 hours of web browsing time. Transformer Book V combines the power of a laptop with the mobility of both a tablet and smartphone, and provides the flexibility to run a wide range of apps. Together with the easy ability to switch between modes and share data between devices, Transformer Book V delivers an unparalleled user experience. In our last review we looked at an 8-inch tablet running on the Atom Z3740 costing under $300. In this review we have the Dell Venue 11 Pro 10.8 inch tablet running the current high-end Z3770 CPU and costing $499. The powered keyboard is an additional accessory at $159. The two units are extremely well built but are they worth it? We take a look in our detailed Dell Venue 11 Pro review. You might get the impression that I like the Lenovo Miix 2 10 when you see how much time I’ve spent with it recently. I’ve just produced 3 new videos, in addition to the unboxing video and there’s lots of testing going on. The truth is that I am really enjoying this tablet-first device. Like the ASUS Transformer T100 I think it’s going to be a big seller as a secondary PC that extends from the sofa to the desktop and includes the holiday, car and hotel in between, both for business and pleasure. Baytrail with Four External Screens: Plugable Dock Demo. 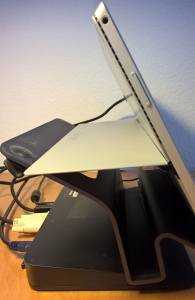 I’m testing a couple of Belkin docks right now with my Ultrabooks and they’re excellent solutions for hot-desking. It’s saved my the use of one laptop as I now take one laptop between two desks rather than leave two in situ. 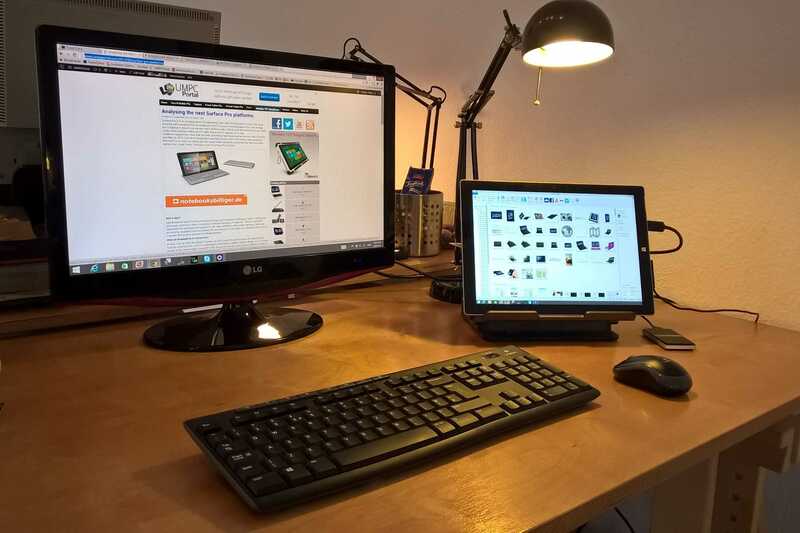 Plugable have some similar docking solutions too. They use DisplayLink hardware and drivers to create screens that work over USB with soundcards and more. We’ve been testing it with Atom since 2008 but plugable have an excellent video that shows it working really well, almost transparently, with four external screens on Baytrail. That 8-inch Baytrail tablet can be your desktop! We highlighted the Q584 / QH55 a few weeks go. It’s the Baytrail tablet that pushes all the specifications to the max. I’ve added the official specifications to the database and later today I should have a chance to get hands-on. If there’s anything specific you need to know, please drop a question in the comments ASAP. 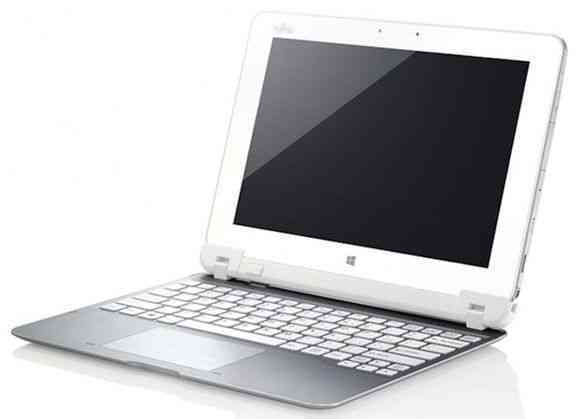 All the specifications for the Fujitsu Stylistic Q584 along with a few ideos, images and links are in the database. The 2560×1600 IGZO display with multitouch and digitizer layer is impressive enough but it’s the 38Wh battery that caught my eye. For a ‘rugged’ tablet (oh yeah, It’s waterproof) that weighs 640gm that’s pretty impressive and should give 10 hours of real-world usage. I notice that the 4G version has 6 antennas. (2 WiFi, 2 UMTS, 1 GPS, 1 NFC) so you should expect some good quality when it comes to the rather important act of connecting to the Internet. 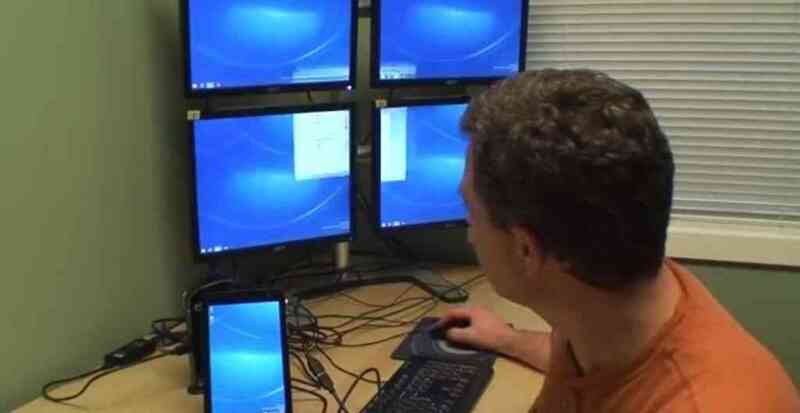 There’s more too because you’ve got a docking station AND a docking keyboard. I’ll try and get more information on those accessories. This Windows 8.1 tablet uses the top of the range quad-core Z3770 processor. Baytrail-M processors with 64it operation and SATA disk interfaces will be available next year but you may not find that devices using those processors won’t match the lightweight build of the Q584. Weight is critical to a usable and mobile 10-inch tablet. We’re waiting on price but of course as this is a business-focused product we’re not holding our breath for the lowest price. If, however, you can get the tablet, keyboard and dock for under $1000 I’ll be impressed. It’s available mid-Dec. Stay tuned for a hands-on post in a short while. Disclosure: Fujitsu have paid for my travel to the Fujitsu Forum 2013. Do You See the PC Opportunity in the Growing Tablet Space? I read a few IDC new releases today. The PC outlook is bad. The Tablet outlook is good. Take another look though, ignore some of the news articles riding on the back of the headline PR and you’ll see something interesting. 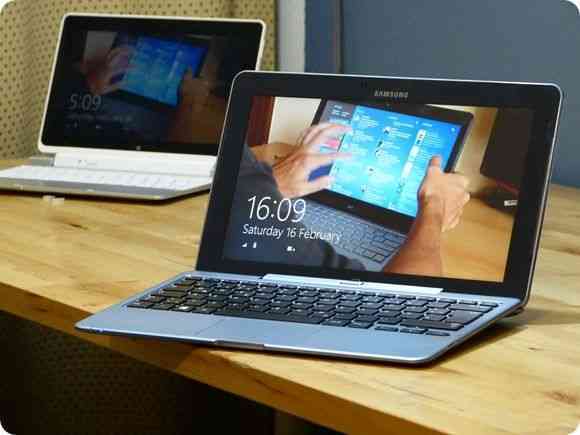 Firstly there’s no obvious consideration of PC evolution into the tablet market. Secondly, there’s a huge opportunity opening up in the 8-13 inch segment. As tablet users start to prefer those smaller, cheaper tablet devices, more value and capability is needed in the larger screen segment. I’ve finally had good hands-on time with every Clovertrail tablet, hybrid and convertible out there today. There are only 11 so it wasn’t too difficult but it’s a good position to be in. Which one is the best? Which one has the best docking keyboard? Which one is the best value? Which on is the best for YOU? 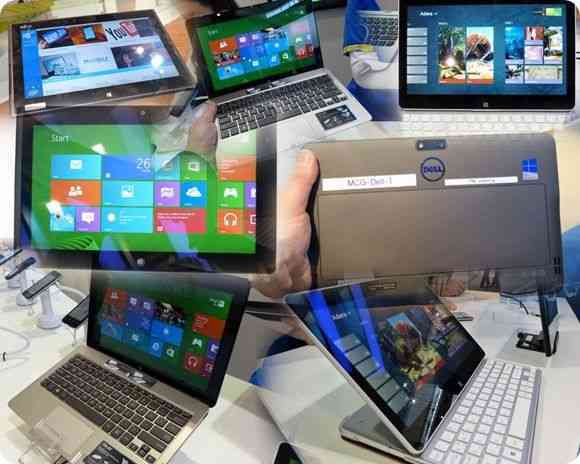 At MWC this week I took videos of the final seven Clovertrail-based Windows tablets and the results are below. I’ve outlined the targe customers and put some thoughts down about what’s the best Clovertrail Windows 8 tablet or hybrid. I must be nuts. I’ve just paid 900 Euro for an Atom-based notebook. Or am I? A few days ago I bought the Samsung ATIV 500T after a disappointing time with the Lenovo Lynx keyboard (of all things Lenovo!) The unboxing went well until I spotted a connectivity problem between the dock and the tablet. I really wasn’t very happy. Today I swapped it out for a new one. I also spotted the 3G version in stock so I end up paying 899 Euro. It’s more expensive than at other retailers too although, for you US people, it’s a business sale which is 19% tax-free here in Germany. Samsung ATIV Smart PC 500T Unboxing, Test and another Keyboard Problem. I took the Lenovo Lynx back to my retailer today (because of this keyboard issue) and came away with a Samsung ATIV 500T and docking keyboard. I’m desperately looking for a good, long-battery life Windows 8 Touch writing / blogging laptop and even though the Samsung ATIV 500T is expensive and doesn’t come with an additional battery in the keyboard dock I decided to give it a try. I’ve unboxed it, presented it and tested the keyboard in the video below. I’ve also hit a deal-breaker. The connector between the keyboard and the tablet isn’t working properly and the keyboard disconnects if you move the tablet. You have no idea how annoyed I am at Samsung. The rest of the device was looking near perfect (Note:for me.) Sigh! At this stage I’ve simply pushed the ATIV to the side of my desk. Clearly it needs to go back to the retailer again but I just can’t face going back-and-forth because of poor quality control on an 800 EURO ATOM-BASED convertible. Why should I waste my time? You’ll see my frustration on the video. I’ll continue to try and get hold of test models for UMPCPortal but I’m pulling out my 800 Euros investment until I can be 100% sure of a good product.